In a tripartite agreement among ABS-CBN Lingkod Kapamilya Foundation, Inc., Pasig River Rehabilitation Commission, and Honda Foundation, Inc., a new linear park will be constructed in Barangay 832 near P. Quirino Bridge in Manila. This is in support to the adopt-an-estero project to further rehabilitate Estero de Pandacan. 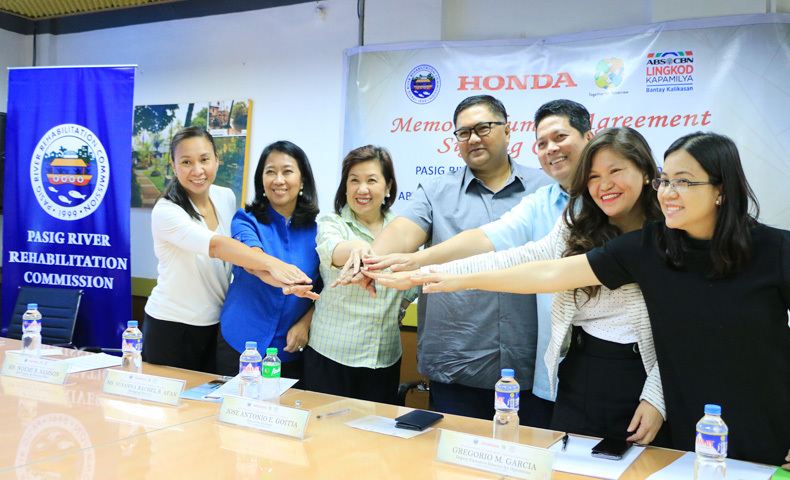 Honda Foundation will fund the construction of the linear park and the solid waste management campaign which will be implemented by ALKFI-Bantay Kalikasan under its Kapit Bisig Para sa Ilog Pasig project and PRRC. The two will also be responsible in the construction and maintenance of the linear park. In photo (L-R): Jen Santos (ALKFI BK Program Director), Noemi Samson (ALKFI Chief Finance and Services Officer), Susan Afan (ALKFI Managing Director), Jose Antonio Goita (PRRC Executive Director), Gregorio Garcia (PRRC Deputy Executive Director for Operations), Riza Quito (HFI Executive Director), Thess Ileto (HFI) during the MOA signing. “The work we have been doing with PRRC, Honda Foundation, and all partners, really involves advocacy work,” said Jen Santos, the Program Director of Bantay Kalikasan. “We are going to do house-to-house solid waste management advocacy programs and we have Information, Education, and Communication materials."